This page contains information on the crosses of County Leitrim. These include cross fragments at Cloone and the Tullaghan or Duncarbry Cross. The location of County Leitrim is indicated by the red star on the map to the right. From about the first century, Cloone was the center for the Con Maicne tribe. It was known as Cluain Con Maicne or “the fertile meadow of the Con Maicne.” The area had been populated deep into the pre-historic period as testified to by the presence of tombstones from the Bronze Age and a number of megalithic chamber graves. St. Patrick visited the area and failed to convert the Con Maicne. He did convert a young prince named Fraoch. At some point, Fraoch founded a monastery at Cloone. This saint was known for his wisdom and piety and it is said that even St. Colmcille sought his council and advice. Farce died around 570. The monastery continued in existence at least into the 12th century as witnessed by an entry in the Annals of the Four Masters that informs us that Muirgeas Ua Muireadhaigh, airchinneach died there in 1101 while on his way to Clonmacnoise. In the area around Cloone there are two high cross fragments and a base. The fragments include a cross-shaft fragment and a cross-head fragment. The shaft fragment stands about 18 inches in height, measures nearly 11 inches across and is nearly 8 inches thick. (Kelly, p. 156) It is located in a niche in the modern wall of the graveyard at St. James Church in Cloone. (Kelly p. 156) The fragment is part of the upper shaft and it retains indications that it once had a ring. The two faces each bear a figural image. The fragment of a cross-head, comprising the transom of the cross is displayed in the graveyard of St. Mary’s Church in Cloone. The fragment is 10 inches in height and 30 inches across the arms. Face A: There is the torso of a robed figure. The head and lower body are missing. The arms extend to either side of the body with the hands spread to show the palms. 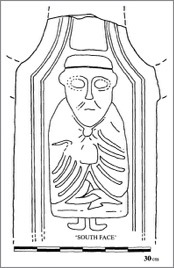 This seems to be part of the figure on the South face of the shaft described above. (Kelly, p. 156, photos right p. 159) It would be consistent with a depiction of the crucifixion. Face B: There is a small figure with an oval face. The crown of the head and lower body are missing. This figure is clothed in stylized drapes and holds a crozier in the left hand. Above the other shoulder is a worn carving that mirrors the position of the crozier head above the opposite shoulder. 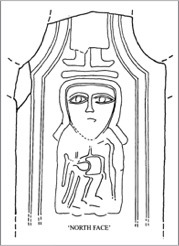 (Kelly, p. 156) This carving might be consistent with an image of either the Last Judgment or Christ in Glory or it could simply be a bishop or abbot..
Face C: One end of the arm has a panel of interlace. Getting There: See the Road Atlas page 25, D1. Cloone is just north of the R201. 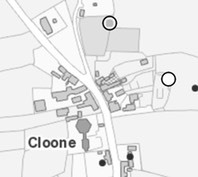 There are two locations for crosses as marked on the Historic Environment Viewer. The map is cropped from the Historic Environment Viewer. 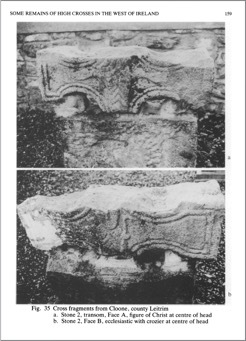 Grant, Christine, “New Leitrim High Cross”, Archaeology Ireland, Vol. 8, No. 4 (Winter, 1994), pp. 16-17. Kelly, Dorothy, “Some Remains of High Crosses in the West of Ireland,” The Journal of the Royal Society of Antiquaries of Ireland, Vol. 123 (1993), pp. 152-163. Tradition states the cross was found along the shore of Donegal Bay, north of its present location. No archaeological features have been found in that area. 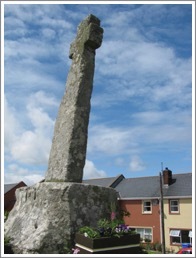 The cross was erected in Tullaghan village in 1778 as noted by an inscription on the base. The intention of Major Dickson, who was responsible for the erection of the cross was to draw attention to the local market which was losing patronage in favor of the nearby Ballyshannon market. Some time later it was moved to its present location on a hillock overlooking the Sligo-Bundoran road. The area where Tullaghan and the presumed monastery are situated is along a very short stretch of coast where the rivers Duff and Drowse meet the Donegal Bay and form boundaries with County Sligo to the south and County Donegal to the north. Getting There: See the Road Atlas page 16, E1. 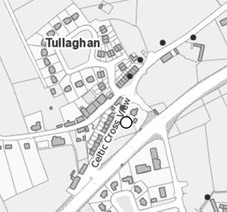 Tullaghan is located on the N15 just west of Bundoran. The cross is visible from the highway, on the north side of the road on a rise. The map is cropped from the Historic Envirnoment Viewer.